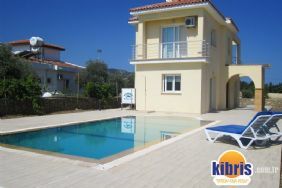 Lovely family villa, set in ideal location with far reaching views. 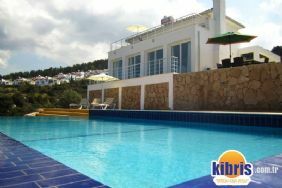 This modern villa is located in the beautiful area of Alagadi with it's famous turtle beach, which has the largest expanse of sandy beach outside the Karpaz. 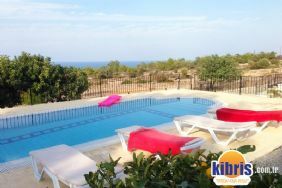 The Villa is set in an elevated position with unrestricted view down to the sea and up to the mountains. Inside, has an open plan living area with fully equipped kitchen with dishwasher, Washing Machine, Oven, Hob and Water Cooler. The lounge area has been designed for your comfort offering a good selection of films. A dongle is provided so that you can access the internet via your own laptop. The dining area has patio doors leading to a covered side terrace and the lounge area patio doors lead to a covered terrace overlooking the pool, garden and views beyond. There is an en-suite to the master double bedroom with a further double and twin bedroom with separate bathroom with bath and overhead shower. This Villa also has a wonderful roof terrace with built in Barbeque. Nature Bay is the ideal choice for a tranquil get away in a quite location, only 10 minutes drive from the nearest supermarket, 5 minutes from the nearest spa hotel and restaurants. Guests are welcome to use the set of golf clubs.